Wonderful location, great view with breakfast ... Too bad my Spanish wasn’t better, everybody was very patient with me on a great holiday. The island is very small with a lot of day trippers. RELAXING BEACH VACATION Hillside Bed and Breakfast Lodge, Apartments & Restaurant on quaint, historic Taboga Island, 30 minutes from Panama City. Natural, quiet hillside location, a walk from the beach, ocean and garden views, ships waiting for Panama Canal. Great food, friendly staff, clean rooms, tours. Located at the edge of a typical Panamanian beach village in a quiet corner of the community. Hillside location, near the rain forest with oceanview just a 10 minute down hill walk to the main beach. A refreshing, quiet, easy, secure, retreat for a weekend, a week or a month. Restaurant by reservation. Tours: Hiking, fishing, boating, snorkeling, swimming, beach combing, exploring, all nearby. Or just kick back in the hammock and relax. Beach / village 5 minutes walk. Calaloo Restaurant by the Beach also. Rooms with air conditioning, fans, private bathrooms, most with hot water. All B&B room windows with tropical tree view or ocean views from apartments, flat screen TV with local channels, shared and private balconies (apartment). 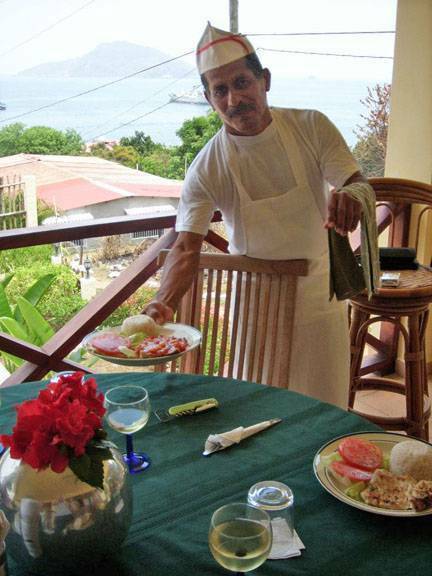 Cerrito chef at our restaurant serving delicious, fresh tropical food breakfast, lunch and dinner BY RESERVATION. Private, comfortable 2 bedroom apartment with kitchen, dining nook, a/c in bedrooms, hammocks, private balcony, hot water, and gorgeous ocean view of ships lining to enter the Panama Canal. Fully equipped 1 bedroom apartments also available with Tropical Rainforest and side ocean view from their balcony. Long term rates on request. Ocean and garden view balcony (shared or private depending on accommodation). All rooms have air-conditioning and fans. Large patio for guest use, as well as a tropical garden with roofed area and hammocks. Living room with TV. Small English library. Hammocks in some areas. Television in social area and all rooms, and Spanish channels. Air conditioned rooms with custom built cast iron Queen or Twin beds. Wifi, Flat screen TV local channels, tropical colors. Bar Frig. Screened windows. Fans. Private bathrooms. Breezy, quiet, hillside location on the edge of the village with a lovely view of ships lining to enter the Panama Canal. Backed by tropical forest, 5 minutes from the closest beach. Shady roofed-ranchito with hammocks in the tropical garden. Restaurant services on request. Cerrito's sister RESTAURANT ON THE BEACH. Local fresh fish, seafood, grilled burgers, and more in an artistic, tropical atmosphere. Open daily except Tuesday, weekend evenings and also open evenings by request/reservation. Restaurant services; depending on type of rate and season a 10% Panama room tax may be applicable. DEPOSIT: Reservations are confirmed with a deposit, in advance at booking time. Room rate and deposit is non refundable. VISA and MASTERCARD credit cards accepted on site and online. Please bring cash, there are no banks or cash machines on Taboga. CANCELLATION: Minimum of 6 weeks cancellation notice is required in order to receive a refund of your deposit. When we can re-rent your room we will refund less the $35 processing fee, and are not responsible for cancellations or delays due to weather or transportation problems or other problems. Guests are responsible for all nights booked. No shows for any reason will be charged the full amount. TAXES & BALANCE OWING AT CHECK IN: Taxes of 10% government tax on the total room charges may be applicable depending on type of rate. Balance payable on arrival. SERVICE CHARGE: We charge no service charge so the staff is not paid an additional service or cleaning tip from Cerrito Tropical, when you receive good service please tip our staff 10% or what you feel is appropriate. From Panama City, Panama, take a taxi to Amador Causeway for the ferry. Check times on our website. Ferry is 30 MIN TO 1 HR. If you have a reservation we will meet you at the pier on Taboga on request. Or, ask for "Pelo" or "Secundo" the truck-taxi drivers and they will bring you to us $1. 50 pp. 5 minutes in taxi, 15 minute easy walk. Ferry or private boat; airport pick up available through a driver we use for an extra charge.